May The Film Be With You. Scotty has a blessed life. Even if he does nothing he still comes out on top. He does nothing at work and gains a promotion, and when he tries to sabotage it, he gets yet more praise. Scotty recognises how unfair this is and it bothers him. He wants it to change but regardless of what he does he always seems to be a winner. Until a chance meeting on a stairway puts Scotty in touch with the Punish Me Palace. It is what it says on the tin, but once inside will he get punished, or learn a way of using his life in a way that is more rewarding? Please Punish Me shows us that regardless of how our life pans out, whether we want it to go the way it is or not, it is about perspective and how you choose to live that life. Esper brings us the opposite of the usual story that focuses on this topic. Rather than focusing on an individual making the most of a difficult or disadvantaged life Please Punish Me looks at a person that has everything they could want without doing anything. The film highlights that anybody can be unhappy with their lot, regardless of status or situation but its how you react to that that matters. Professionally shot, the film has a unique narrative that will keep you guessing as to where the lead character will go next and how he will gain his punishment. Well written and a fairly solid acting performance from all involved. Please Punish Me is intriguing and funny in parts, it will hold your interest and deliver its message in a way that you don't even realise it has been delivered. Remember it isn't how your life is that matters, it is how you react to it. View the trailer on the link below. The film uses colour as a metaphor for the relationship itself. The film is presented in black and white whilst they communicate via text. We are provided with a colour 'selfie' that they take when they realise it is 5 years since they started dating, having met via website. Apt. The colour of the photograph representing the spark of physical contact. The film then moves into colour once they couple start communicating face to face. This use of colour represents the benefits and vibrancy of communicating together face to face. It is what brings life into the film, and into the relationship. Social Connection uses its visuals in place of speech and it works well. It is a simple film that delivers its message in a clear and understated way. It depicts a society where communication may very well be losing its ability to communicate effectively. This film is worth a watch. On your phone. Whilst on a date. Use the web address below to view this Award Winner at Worldfest-Houston International Film Festival 2015. Directed by Tofiq Rzayev 'The Girl in the Woods' is based on his English screenplay titled 'Find Me' which has been transformed into a Turkish screenplay by Rzayev himself. Ceren, finds a cryptic message from her missing boyfriend Ali and involves a mutual friend, Mert in finding him. Mert stumbles across an intriguing woman in woods as he searches for Ali but she is not what she seems. The Girl in The Woods is a story of a women trying to find that love, that connection with another that she craves. But she also craves perfection. And when it becomes apparent that the men she snares are not perfect there are horrendous consequences. The film is an interesting take on co-dependency and a need to be loved unconditionally that then manifests into something much more sinister. The camera work and lighting in the piece look semi professional and demonstrate a good standard of production. The editing of the shots is done well using reaction shots as well a background blurring to focus on the individuals in each scene. Unfortunately tinny and excessive natural sounds such as grass underfoot and wind are distracting and at times the actors voices becomes secondary to the natural elements. The film is executed well overall in terms of screenplay and production, showcasing the skills of experienced short filmmaker Rzayev, however the sound editing could be improved to make the overall experience more absorbing. Excellent acting on behalf of the mystery women who is beguiling and enchanting, but equally unnerving. The film explores a much used topic but offers a different slant. It would be interesting to develop her character more, as well as get more background to the other characters but the mystery behind them does add something to the piece, encouraging viewers to use their imagination. Make a Half Decent Addition to the Franchise. Mission: Possible. Cast: Tom Cruise, Simon Pegg, Jeremy Renner, Rebecca Ferguson, Ving Rhames. The Mission Impossible franchise has its backbone in impressive stunts and espionage (mission impossible 2 notwithstanding, which was one long explosion). The advert for latest instalment Rogue Nation which sees Ethan Hunt (Cruise) hanging off a plane thousands of feet in the air set audiences up for more of the same. Rogue begins (after the kamikaze plane ride) with Hunt being kidnapped by the Syndicate. Predictably, with the help of a double MI6 agent Isla Faust (Ferguson), he escapes. The Impossible Mission Force (IMF) is disbanded and Hunt goes rogue to prove the existence of the Syndicate and bring them to justice. Six months later Hunt enlists the help of IT whizz kid and bromance partner Benji Dunn (Pegg). Meanwhile disbanded IMF member William Brandt (Renner) approaches MI veteran Luther Stickell (Rhames) to help him locate Hunt before the CIA do and eliminate him. Hunt Dunn and Faust are on a mission (impossible. Boom!) to find a ledger that contains all the names of the Syndicate operatives. We follow them all as they negotiate twists and turns along the path to discovering the truth. Look out for a few slightly predictable but nonetheless entertaining hairpin bends. The MI franchise has been infamous for its daredevil stunts, or rather for Tom 'The Eagle' Cruise's stunts. Rogue Nation is no exception. There has been widespread speculation and awe at the aeroplane hanging tour de force that was ingeniously included in the trailer. Short of removing any Health and Safety necessary wires the stunt is all physical effects. Simon Pegg, who appears in the trailer dressed as some sort of foliage based Ewok, stated that the tension was very real as Cruise clung to the site of the aircraft and ascended toward the clouds. Its one way to avoid Ryanair extra charges. Thankfully for Rogue Nation the trailer hasn't done a Free Willy and shown the best bits in the trailer. In fact the kamikaze plane ride is in the introduction to the film. What it does do is set us up for the level of intensity of the rest of the film in terms of action, and also establish the relationship between Hunt, Dunn, Stickell and Brandt. Cruise's insistence on physical features has a definite impact on the action within the film. There is a realism to both the action and the reactions of the actors that isn't evident when computer generated imagery is used. There are honest reactions and there is honest action. The audience are inside the car during the crash, or on the bike during the chase and it brings with it an added edge to the action. When compared with the big explosive action in the first, but more so the second (if you dropped a pin and there was a 40 foot explosion), MI film where the audience views it mainly from the outside Rogue Nation has a more personal touch to the action placing viewers at the forefront. What is wonderful in Rogue Nation is that finally Simon Pegg is utilised to his full potential. In the third film he had a small very supporting role, in Ghost Protocol he was more prominent but in Rogue he is a main player. Pegg brings with him an established talent for reaction comedy and he bounces of the other characters, particularly in his bromance with Hunt, to perfection. His IT genius and action involved character Dunn would make Tim Bisley proud, and the fact he uses his hi-tech work computers to play first player action games is almost a nod to his geekism. Dunn adds a humanistic touch to the film that not only enhances the comedic element but makes the film much more enjoyable. In the first two films any humorous attempts fell flat but Pegg pulls them off with panache. In previous MI films the female characters, although intermittently formidable, have generally become a damsel in distress. In Rogue Nation Rebecca Ferguson does no such thing. Her character, Isla Faust, is an equal to Hunt. They are equally skilled and equally talented. In one scene it is indeed Faust who saves Hunt. Also, Bryce Dallas Howard if you are reading this, she takes her heels off to run. Rogue Nation is easily one of the strongest films in the MI franchise. It may be predictable in places, but there are less obvious twists as the film progresses. The action and stunts involved are intense and enthralling, aided by Cruise' daredevil nature. There is a charming comedy element that works well and helps the audience to relate to the narrative which is mainly brought about by Pegg as Dunn. With a stronger female character (singular, there is only one female......) Rogue shows definite positive progression for the franchise and with the sixth instalment in the planning let's hope for further improvement. We can only guess as to how Cruise will top his plane surfing stunt. Back in 1995 when the world was engulfed by denim Walt Disney joined animated forces with a Californian CGI company called Pixar and released their first combined feature film. The Acadamy Award winning Toy Story snuck onto our screens when nobody was looking. Since then Pixar have released a further thirteen films including two Toy Story sequels. Their fifteenth feature film is now in cinemas and Inside Out is set to be just as popular and successful as their previous animated offerings. Brought to the screen by the same director as the equally emotional Up (squirrel! ), it is easy to expect a lot from Inside Out, and you won't be disappointed. The production pedigree is obvious and the film does an admirable job of evoking the very emotions it is portraying. The film focuses on Riley, an 11 year old girl. Actually, it focuses on the interior of her mind and the emotions that work their. Inside Riley's head, and everybody else's head, five core emotions control their responses and how that individual navigates life. As the makers stated when they pitched the film 'Riley is the setting rather than the main character'. 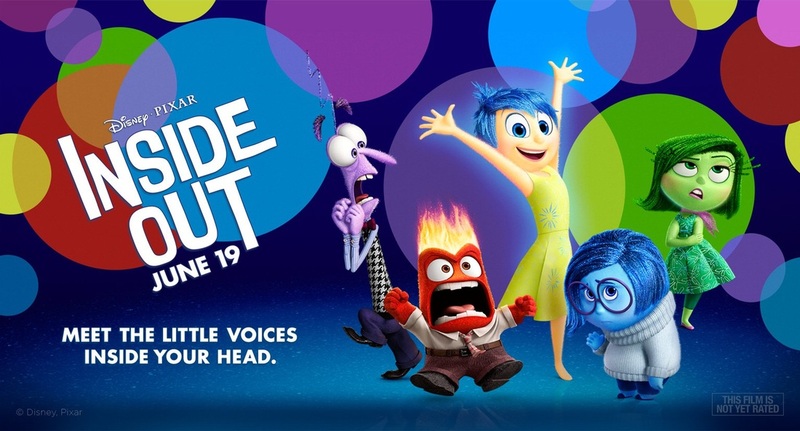 According to Inside Out these core emotions are Joy, Sadness, Disgust, Fear and Anger. Led by Joy these anthropomorphised characters toil to ensure Riley stays happy. All is going swimmingly until Riley and her parents leave their idyllic Minnesota home and travel to a new home in San Fransisco. Everything is different. And there is broccoli on pizza. Ew. Riley's emotions work to keep her happy during these changes in environment. New people, new school, new home as well as growing up in general and at the same time Sadness seems to be getting more prominent. Things gets more complicated when Joy and Sadness get lost in the recesses of Riley's mind leaving Fear, Anger and Disgust as her only option for emotional response. Sadness and Joy have to journey back to Headquarters via various sectors of the mind to ensure Riley can deal with situations appropriately and the different domains of her mind do not shut down. There are a number of aspects to this film that make it a strong contender for the best Pixar film produced so far. A strong statement, but well deserved. One of the most appealing aspects of the film is the sheer depth of imagination and creativity that is evident in the design and visual representation of Riley's mind. The way in which the mind is mapped out and how it functions are brought to life is spellbinding to observe. Inside Out manages explain how our emotions effect us in a way that is accessible and compelling. Previous outings for Pixar have had a universal appeal covering a variety of ages and Inside Out is no different. There are layers within the films plot that will appeal to a plethora of audiences. The playful animation, Riley's long forgotten imaginary friend Bing Bong for example and visual design such as bewitching Imagination Land will charm younger viewers whilst the storyline around Riley's predicament and maturing will appeal to those of a similar age who relate to the situation. The nostalgia aspect will appeal to adults who have been through the maturation process, along with cultural jokes that are aimed at a more mature audience. This is evident in the Memories Library of Riley's mind, set out like a brain, where minion style workers manage her memories. Every so often they will send up an ad jingle to the forefront of Riley's mind for no reason. It is these life observations that make Inside Out so widely appealing. There is a familiarty to the plot that will feel cosy many Pixar fans. Although the film is arguably the first unique and inspiring Pixar animation since 'Up' there is still the conventional narrative that follows an unlikely and superficially incompatible duo, in this case Sadness and Joy, on a journey where they learn to like and accept each other. This was evident in 'Toy Story', 'Finding Nemo' and 'Up' and it gives the film a comfortable and established feel that the audience will connect with whilst still being kept interested by the fresh perspective. The film explores how the mind develops and changes as we mature and it does it in colourful and otherworldly detail. Directors Doctor and Carmen do an admirable job of explaining a complicated process in a way that makes it appear simple and accessible. The fact Riley only has Anger, Fear and Disgust to react with acts as a catalyst for her psyche to change. Parts of her psyche begin to collapse and become abandoned like derelict buildings only to be replaced by more relevant and typical of a maturing young girl. The islands that make up aspects of her personality collapse and are replaced by fresh new ones that signify her changing personality and interests. The main message from the film is an important one. Inside Out shows us that sadness is OK. It shows us that it's ok not to be happy all the time. Recognising the need for sadness is healthy and it helps to have a well rounded view of life. Sadness adds to nostalgia and helps us to deal with situations appropriately. As Sadness comes to the forefront of Riley's mind she is able to express her feelings appropriately and to re-connect with her parents. This is a poignant message for children and adults alike. The emotions themselves are brought to life by talented actors who inject humour and feeling into the film. Poehlers Joy has just the right amount of bounce without becoming annoyingly perky. The currently omnipresent Hader is hilarious as fear whilst Kaling injects some teenage 'tude to Disgust. They bounce off each other wonderfully adding some office comedy to the film. Inside Out is destined to be a seminal film, offering a multitude of options for assignments and dissertations for both film and psychology students. Displaying charming and magical imagery with poignant observational and cultural elements the film will appeal to all. Allow the film to suspend reality whilst you delve into the mind, and allow emotions to take you on a journey through your psyche. Cast: Amy Winehouse, Mitchell Winehouse, Blake Fielder-Civil. Occasionally a film will come along that haunts you. It stays in your mind for days after you have viewed it. It leaves an imprint on you that lingers. There is a distinct possibility Amy will be one of these films. In 2010 film director Asif Kapadia released a documentary film entitled Senna. The film utilised archive footage along with interviews to tell the story of Formula 1 driver Ayreton Senna. The film was released to critical praise and it provided an honest and sometimes very tender portrayal of Senna. Kapadias' latest project, Amy, is set to be just as successful. Amy chronicles the all too short and often chaotic life of British musical talent Amy Winehouse. Just as with Senna the film is constructed using from archive footage, interviews (100 in total) and Amy's own music which forms the soundtrack. This is all deftly edited together to tell the story of Amy's rise from teenage musical prodigy to the tortured yet beautifully talented soul she was when she so unjustly passed away in 2011. We see her battle alcohol, drugs, bulimia and her own personal demons. The film follows her turbulent relationship with Blake as well as other partners, friendships and familial relationships are all put on display as we delve into her life. The film effectively ensnares and gets you invested in the narrative utilising some effective techniques. As with Senna, interviews are used to narrate along with audio archive footage. The interviews are used as a voice over whilst onscreen we watch archive footage of Amy. We do not see the people being interviewed. This has the effective of focusing you on what is screen, on Amy. The result of this is that you are drawn into the story. You are drawn to Amy and into her life. You begin to connect with her on a personal level as you see her through the eyes of friends, family, lovers and the media. This culminates in an intimacy that lingers and you almost begin to feel like you are a friend or an acquaintance. This filters through the entire film. 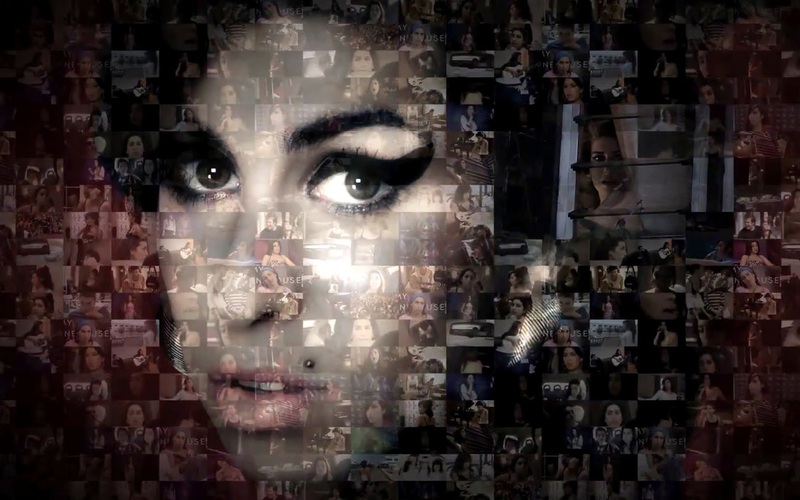 Kapadia utilises the way Amy wrote lyrics as a coping mechanism, as a method of dealing with what was going on around her as a the backbone of the film. Her lyrics tell her story, just as they did in life. They mirrored her pain and her happiness and Kapadia respects this. Effectively, Amy tells her story and Kapadia has fitted the pieces together like a jigsaw. This makes it all the more personal. Amy is a roller coaster, both as a person and as a cinematic experience. It takes an emotional toll on the viewer and evokes a myriad of emotions, including guilt as you watch Amy get lost in the chaotic mess that her life turns into. It is difficult to not feel part of the problem as you watch her through the eyes of the media as they hound her, or as you remember smiling or giggling at the jokes made about her at the time by various comedians. Kapadias' film has this unnerving yet wonderful way of eliciting these emotions through the editing and use of voyeuristic narrative. The voyeuristic atmosphere extends to her friends and family as you see and hear emotional pleas and tear filled accounts of the difficult times that are so raw its difficult not to connect with them. On its release the film was met with negativity and accusations of clever editing and inaccuracies but whatever the rela-life accuracy of the film the portrayal of this vulnerable and elegantly talented individual highlights her difficulty in coping with what her life spiralled into, but it also showed the girl behind all of the headlines. The funny, charismatic and charming girl who was destined to be a musical artist. There is only one word to describe this film. Beautiful. It is affecting and draws you in in a way that keeps you invested throughout the film. You are then given an emotional hangover to deal with for a time after you leave the cinema. Amy is intoxicating and it will engulf you. Listen to her music after you have watched this and it is guaranteed to feel different. Cast: Paul Rudd, Michael Douglas, Corey Stoll, Evangeline Lilly. Back in 1963 comic book heavyweight Stan Lee introduced the superhero world to an unusual, and smaller than average, character. Ant-Man, aka Hank Pym, shrank to life in issue 27 of Tales to Astonish and went on to become a founding member of the Avengers with his girlfriend Wasp, aka Janet van Dyne. 52 years later and the miniature hero is back in size alternating action on the big screen. The film focuses on Ant-Mans second incarnation rather than the Hank Pym story (it was deemed not family friendly, read the comics to see why) and sees Scott Lang (Paul Rudd) don the suit that gives him the ability to shrink to the size of an ant (it's all in the name) and make allies of the namesake insects. Ex-con Lang is approached by previous Ant-Man Hank Pym (Michael Douglas) to help him protect the secret behind the suits abilities from the bad intentions of Darren Cross (Corey Stoll) who is looking to invent a second suit and becoming Yellowjacket. This would be a bad thing. Pym is looking to utilise Langs burglary skills to steal the magic ingredient and foil Cross' plans. With the help of his emotionally distant daughter Hope van Dyne (Evangaline Lilly) Pym trains Lang to use the suit effectively and develops a plan to stop Cross developing the Yellowjacket suit. Just to add a bit of depth to the plot, Lang takes on the job in order to get some money and get himself on his feet to prove to his ex wife that he has changed his ways and gain access to his daughter Cassie. Visually, the film is very impressive. The VFX imagery that is produced when Ant-Man shrinks is incredibly well executed with a strong attention to detail. This is not Honey I Shrunk The Kids. From the dirt and grime in the bathroom to carpet fibres the visual offerings are accomplished to an impressive standard. Russell Earl was the Industrial Light and Music VFX supervisor for the feature. Work of note to date include Star Trek (2009), Harry Potter and the Pilosophers Stone (2007) and Pirate of the Caribbean: Curse of the Black Pearl (2003). Earl utilised CGI, still macro photography and motion pictures to achieve the tactile and realistic imagery that adds the dramatic and striking visual extravaganza, especially during the fight scenes. Within Marvel circles, the film has become infamous as being the film that Edgar Wright (Shaun of the Dead, Hot Fuzz etc) left more than three quarters of the way through development due to 'artistic differences' taking with him fellow writer Joe Cornish (writer of Attack the Block and star of UK TV show Adam and Joe). The team was then joined by Peyton Reed who is known for 90's cheerleading flick Bring It On and Danny Wallace book adaptation Yes Man. He may appear to be an odd choice but it is worth noting he spent time on the development of Fantastic four (2005) which was also produced by Marvel Cinematic Universe heavyweight Kevin Feige which may go some way to explaining the choice. The film has tendrils of Wright and Cornish' writing which seems to support Reeds finished product. Both are credited as Executive Producers and this is evident throughout with the use of humour which is similar to the humour used within the Cornetto Trilogy and Wrights UK TV series Spaced. Certain scenes also reek of Wright, such as the flashback scenes where the people in the flashbacks are voiced by the person telling the story. The film does not try too hard to be funny and it recognises its ridiculousness in terms of concept. It would be easy to wish the film away in dreams of a pure Wright and Cornish interpretation, and that would be something that would inevitably be better executed. The casting of Paul Rudd aids the comedic robustness of the film with the delivery of his lines highlighting his wisecracking talent that has been honed through films such as Clueless and Anchorman as well as his long running stint on TV show Friends. It is due to this experience that he is able to express the films comedy element better than any other character within the MCU, with the possible exception of Robert Downy Jr as Iron Man (Doth mother know you wealth the drapes?). Rudd is an unusual choice for the part and there has been speculation regarding his ability to portray this role. The very fact that he is not a stereotypical superhero makes him all the more suited to this role. The role is an ex con that dons a suit to give himself special abilities and Rudd is able to pull this off well. Michael Douglas has a strong screen presence as Langs mentor Hank Pym. Evangeline Lilly is almost consistently on the verge of tears or about to punch someone, or both. With the rumours of her taking on the role of Wasp we will see if she can develop her character interpretation beyond two emotions she seems to live within in Ant-Man. What Does A Hitman Do When He Has Nothing To Do? Kill time, Of course. Review of Award Winning Short Time to Kill. It is the black of night outside. Nothing moves inside the apartment. Suspense music sets the scene. Then a tall, dark figure appears, an armed man quietly and deftly enters the apartment. He sits. He waits to carry out the task he has been set, with his weapon pointed at the door. Now all he has to do is wait patiently. And wait. And then wait a little more. 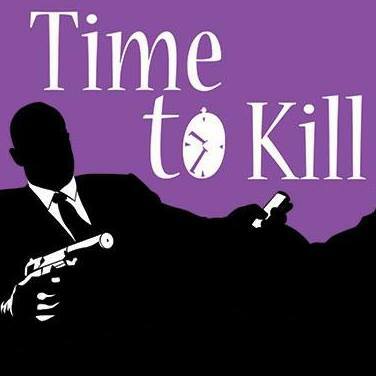 How does a hitman fill his time, when he has time to kill rather than a target? Does he do something befitting his dark and mysterious character? Does he plot other jobs, or does he sit calmly and tolerantly awaiting the time when he can carry out his grim job? Or does he do some yoga, take calls from his mother and friends and fix the annoying squeeky door? This award winning short film explores this very concept. Written by Christopher T Wood, Scott Frank and Justin Rettke (Rettke also directs) the film gives the viewer an insight into the deadly hitman we so often see in feature films. The film offers a refreshingly humanistic viewpoint of a person that is dealing with the same problems and dramas as the rest of us, be it relationship problems, disillusion with work or an interfering mother. The film effectively uses comedy to portray the person behind the gun and transform the hitman from a deadly killer to a likeable protagonist. Christopher T. Wood stars as the hitman and guides us through the film utilising both comedy and suspense to give a convincing performance as the troubled killer. Wood effectively depicts the main characters underlying vulnerability and an awkwardness that we would not normally see. The film deserves the awards it has already been bestowed with and it sure to gain critical acclaim on its release for its sincere yet humorous portrayal of an individual and human nature. Make sure you give yourself time to see this film. We can promise you will not feel the need to fill time. Why The Hell Was Liam Neeson Buying Cereal? Starring: Mark Wahlberg, Seth McFarlane, Morgan Freeman, Amanda Seyfried, Jessica Bath, Giovanni Ribisi. The inappropriate, swearing, usually stoned, walking, talking teddybear is back. 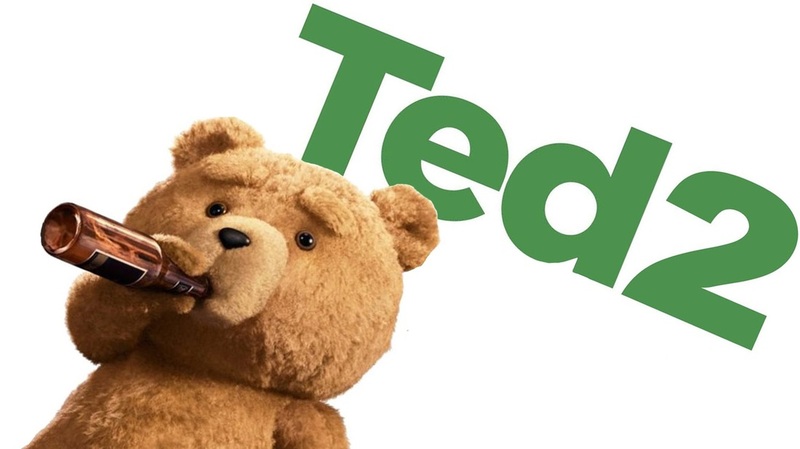 In a haze of smoke Ted returns to our screens in Ted 2. The return has been highly anticipated and unfortunately the hype has not been lived up to. That is not to say film is bad, who doesn&apos;t like a grown man covered in sperm, but this Ted instalment won&apos;t leave you longing for a thunder buddy like the original did. Ted 2 opens with Ted (McFarlane) marrying his beloved, the ever classy and oh so well spoken Tammy Lynn (Bath). They are married by Flash Gordon, which lets face it, is either pretty awesome or a tad sad. A year later and the cracks are beginning to show so they decide, oh so wisely, to have a baby. This is where they come upon a sticky wicket (not related to the grown man covered in sperm). Technically, Ted is property. He has no rights and is not recognised as a human being. This has devastating consequences for Ted and Tammy Lyn including the non recognition of their marriage. So John (Wahlberg), Ted and their pot smoking lawyer (!) Sam (Seyfried) set out on a mission to get Ted recognised as a person and the rights that every American citizen is entitled to. To do this they enlist the help of the caramelly and velvety voiced Patrick Meighan (Freeman). It would indeed be delightful to sleep on a bed made of his voice. Just to put an annoying, creepy Tiffany loving spanner in the works Donny (Ribisi) returns to kidnap Ted again. Its all just a little bit of history repeating. Whilst Ted was fresh and funny Ted 2 feels more like an extended episode of Family Guy. From the all singing all dancing opening sequence to the numerous movie skits to the random &apos;out of film&apos; sequences (a Saturday Night Live scene springs to mind). These all result in an atmosphere that is closer to McFarlanes animations than it does the original Ted. As the title of this review states the scene featuring Liam Neeson buying cereal serves no purpose, other than to make your brow furrow. It reeks of Family Guy randomness. Fortunately the film is still humorous and thankfully McFarlane has not just rehashed the same jokes and storyline. Whilst the humour is in the same distasteful vein we associate with McFarlane it does not feel repetitive. There are some very funny moments, but not as many guffawingly, drink spurtingly funny as in the original which is maybe to be expected. there are some touching and meaningful points too and the overall theme of equality and diversity is very topical right now even if it is dealt with in McFarlanes usually crass and loutish way. This is not a derogatory description. As they do in Ted McFarlane and Wahlberg give solid comedy performances and bounce of each other perfectly. Seyfried felt slightly misplaced and did not mesh as well into the film as Mila Kunis did in the original. The animation of Ted is as faultless as the original and as in Ted the actors work with it with finesse. Three short films. three short reviews. Lomond Films are an independent amateur film company based in Scotland. They produce amateur short films with just a camera and editing equipment. In this article we are going to look at three of their films. Watch the films by clicking the videos to the left. Dating can be hellish. Especially if you are thrown into a hotel with other singletons for a weekend. Lomond Films utilises the trend of real life documentaries that is currently experiencing a surge in popularity to explore this concept. Hotels, restaurants, benefits, hospitals. They have all been targeted and Looking for Love uses this style effectively to provide the viewer with a funny and well scripted short. The shots used are very similar to those used in documentary series and the overall atmosphere works for this kind of film. The acting is occasionally questionable but the lighthearted feel of the film manages to distract from that. Join the individual and sometimes eccentric characters and see which ones manage to make it to the bedroom, assuming the booze doesn't get in the way. Or their personalities. Ever since George A. Romero's Night of the Living Dead (and the sequels) turned zombie films into a genre all of their own they have been crossbred with other genres. In this short by Lomond Films we see it bred with a bit of comedy and with travelling across dimensions. At a house party two friends are convinced to rub a ring (!) and are transported to a place that they wished for. Unfortunately this doesn't go quite to plan and a nice romantic picnic includes a zombie girl. If they can make their way back to reality, with everything go back to normal? This film is distinctly amateur and it makes no illusions about that. It does suit the film to a certain extent and although both script and acting could be improved it is an enjoyable watch. If Indiana Jones had been filmed on a council estate, Consequences is a pretty fair representation of what it may have looked like. Two adventurers run through a concrete, graffiti rid jungle in order to gain a golden egg. The film then transforms into the Matrix with men in long black coats chasing them. The female adventurer is then captured and asked to choose a red or blue drink in order to get rescued. The film leaves us guessing. With very limited scripting the film relies on action and physicality to tell the story and keep the plot moving forward. This works well and although the pace isn't as quick as it could be it does build some suspense. There is a strong use of space and environment which adds to the spirit as well as a soundtrack helping to build atmosphere. Consequences is an interesting amalgamation of two very different films, and Lomond Films manages to pull it off. Starring: Pierre Coffin, Sandra Bullock, Jon Hamm, Michael Keaton, Geoffrey Rush. It is almost impossible to not know what a minion is these days. Since Despicable Me was released in 2010 these little yellow guys have been a big hit. They have spawned their own merchandise, a mini movie series and an almost cult like following. They have a Midas Touch on anything they become related to and naturally, they now have their own big screen adventure. The film is essentially a prequel to the previous two films and focuses on how the minions evolved and their existence pre Gru. Viewers follow the yellow capsules as they try and find a new evil master to work for and in turn save minion kind from perishing. Three brave (stupid?) individuals, Kevin, Stuart and Bob, head off to America to attend Villian-Con, a kind of evil villian based Comicon in order to find a new leader. Here the trio are introduced to the world famous and beguiling Scarlet Overkill, the worlds first female super villain voiced by Sandra Bullock. The trio accompany her back to London where they assist her and her husband, Herb (Job Hamm) in a plot to take over the world and steal the Queens crown. The film then follows Kevin, Stuart and Bob as they try to save their species via various madcap adventures. The film has a strong cast and on paper it should have been a huge success. Unfortunately the film falls short of what has come before and does slightly miss the expected mark. The introduction which highlights the Minions Darwinian evolution is the most entertaining part of the film. Whilst the premise had a lot of promise the film itself is by no means comparable to the Despicable Me films. Standing of the shoulders of giants. Or rather, falling off the shoulders of giants. Whilst Pierre Coffin gives a talented performance as the minions there are sections where it is purely 'minions' and it can get difficult not to detach from the film as there is no clue as to what is going on. The scripting for all of the characters is not as well executed as it was for both Despicable Me and Despicable Me 2 and there is also a sense of having too much squeezed into a short film. It jumps from scene to scene and plot point to plot point with little development in-between. The film is enjoyable and children will love it but there isn't the same attention to detail that make the Despicable Me films so universally appealing. It seems to have forgotten the adult audience completely. Take the kids to see it and enjoy it for what it is, but don't expect anything on parallel to Gru-fun. My name is Stu Greenfield and I am a life long film fanatic. It's a bit of an obsession really. I may need an intervention. This blog is designed as an outlet for me to publish all of my film based ramblings. I try to be as fair as possible. I'm not a 'shock-jock' style reviewer who hates everything and swears profusely. I review what I feel is strong and weak about a film and let the audience make up their mind based on my insights. Enjoy!